Hammurabi (1792-1750 BC) was king of Babylonia, and the greatest ruler in the first Babylonian dynasty. He extended his empire northward from the Persian Gulf through the Tigris and Euphrates river valleys and westward to the coast of the Mediterranean Sea. 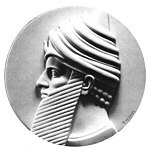 After consolidating his gains under a central government at Babylon, he devoted his energies to protecting his frontiers and fostering the internal prosperity of the empire. Hammurabi ruled, Mesopotamia, the land between the Tigris and Euphrates rivers, what is today known as Iraq. He is credited with uniting most of this area under one extensive empire for the first time since Sargon of Akkad did so in about 2300 BC. To do this, Hammurabi waged several military campaigns. The purpose of most of his operations was to gain control of the Tigris and Euphrates waters, on which agricultural productivity depended. Other campaigns were over control of trade routes or access to mines in Iran. The king began his military campaigns in 1787 BC by conquering the cities of Uruk and Isin to the south. He then turned his attention to the northwest and east. The power of Assyria prevented him from achieving any significant results, and for 20 years no major warlike activity was reported. He used the time to fortify cities on his northern borders. The last 14 years of Hammurabi's reign were overshadowed by war. In 1763 he fought against a coalition east of the Tigris that threatened to block access to metal-producing areas in Iran. The same year he conquered the city of Larsa, which enabled him to take over the older Sumerian cities in the south. He followed this victory with the conquest of Mari, 250 miles (400 kilometers) upstream on the Euphrates. During his last two years the king concentrated on building defensive fortifications. By this time he was a sick man, and the government was in the hands of his son, Samsuiluna. Hammurabi effected great changes in all spheres of life, mostly from the transformation of a small city-state into a large empire. Most of his rule was given to the establishment of law and order, religious buildings, irrigation projects, and defense works. He personally oversaw the administration of government. In doing so he failed to create a permanent bureaucratic system. This failure was a primary reason for the rapid deterioration of his empire after his death. Hammurabi's accomplishments are believed by historians to be exaggerated. This is partly because of the fame he gained when his law code was discovered. His lasting achievement was to shift the main theater of Mesopotamian history northward, where it remained for 1,000 years. Throughout his long reign, he personally supervised navigation, irrigation, agriculture, tax collection, and the erection of many temples and other buildings. Although he was a successful military leader and administrator, Hammurabi is primarily remembered for his codification of the laws governing Babylonian life called the Code of Hammurabi. Bottero, Jeans, Cassin, Elena, and Vercoutter, Jean (eds. ), The Near East: The Early Civilizations (1967).